Isaiah Harris-Winn (Frederick, Md./St. 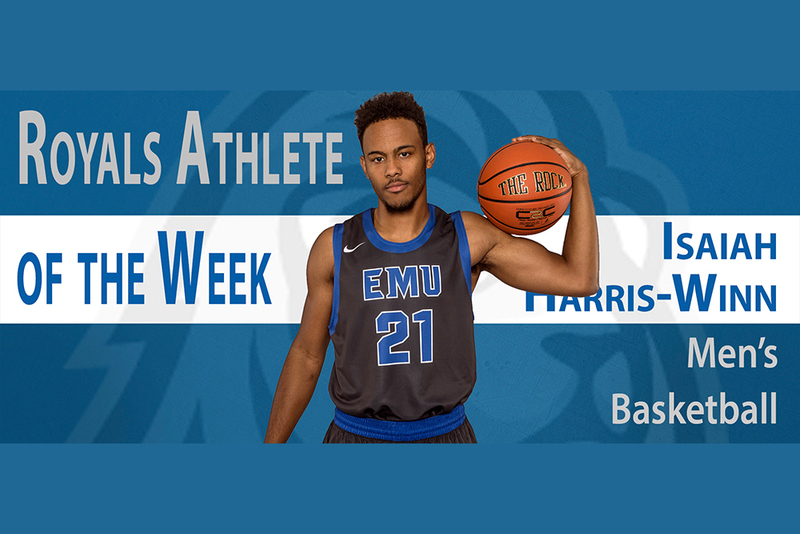 Maria Goretti) got a running start to what promises to be a very exciting senior season for the Eastern Mennonite University men’s basketball player. In last weekend’s tournament at Messiah College, Harris-Winn averaged 15.5 points and 10.5 rebounds over the course of the two games. In the championship game against Messiah he earned his first double-double since his sophomore season with 19 points and 12 rebounds. After a difficult junior season, Harris-Winn put in a lot of work to make sure his last year at EMU is a success. Head coach Kirby Dean has noticed the difference. Harris-Winn has high hopes for the team this year. He also loves the camaraderie with his team and wants to continue to build the team chemistry. When Harris-Winn was in middle school he played three different sports: football, basketball and baseball. Eventually he dropped the other two sports; basketball is the one he kept coming back to. A business administration major, Harris-Winn hopes to own his own store someday. For now, however, Harris-Winn will focus on making the most of his last season at EMU. After seeing how Harris-Winn has approached the opening weeks of the season, Dean expects to see great things from him. “I think the sky is the limit for his senior year, if he continues with this type of mentality for the entire year,” he said.